Here are the modified jigs in use. Note that there is a "Left" and a "Right" jig. 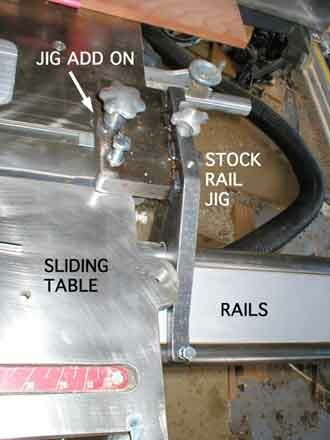 Here's a labeled detail shot of the "Right" (front) modified rail jig in use. I'd like to be able to set the sliding table 0.008 to 0.010 inches ABOVE the saw's table surface. Initially I thought that would require filing or grinding some metal off the bottom of outside edge of the extensions. 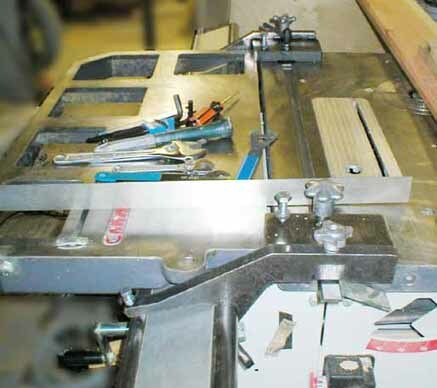 But once I got the jigs installed I reailized that I could loosen the knob holding the miter slot bar and tighten the bolt at the edge of the saw table - raising the rail and sliding table above the saw table. BTW - the jigs were $100 US for the pair. The modifications were another $270 US. That was for a custom "one of" job. Subsequently Bill P. talked a machinist friend into doing fourteen sets at $225/set and I put up the front money to have them made. Now thirteen other lucky members of the Yahoo Robland X31 Group will have jig sets at that price. The machinist, with the experience of making the first sets, has since upped the price to over $300 and would prefer not to make any more. If you missed out on the first batch you may have to start bugging Laguna Tools to sell you a pair of the stock jigs and have them modified. When things settle down I'm going to loan Jason at Laguna Tools my jigs. If he can persuade The Powers That Be, the modified jigs may be available from LT..